 Vagnsset med 3 personvagnar typ NS "ICL"
Vagnsset med 3 personvagnar typ NS "ICL"
Denna produkt ger dig 2340 bonuspoäng. Vagnsset med 3 personvagnar typ NS 'ICL', totallängd över buffertar 495 mm, epok VI. Prototype: Dutch Railways (NS) ICL express train, consisting of a type Aimz express train passenger car, 1st class, and 2 type Bimz express train passenger cars, 2nd class. The cars look as they did about 2009. Model: All of the cars have close coupler mechanisms. Interior lighting can be installed in the cars. Total length over the buffers 495 mm / 19-1/2'. 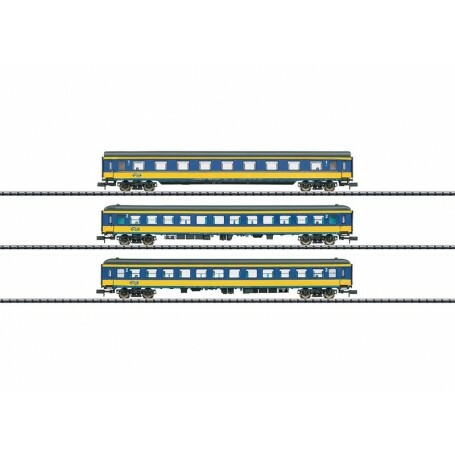 The class 1800 locomotive goes with these cars and is available under item number 16003.